Thanks and hope you have a wonderful weekend. We usually see 2 or 3 when we hike through an open meadow area near us. Always glad to see and hear them. Hi Jim, they do have one of my favorite songs and yes we are also glad to hear and see these guys every spring. And when they sing, ahhh, everything is right in the world. Lovely post, Mike. Hi yes it is a fine song and one I never tire of. Hope you have a wonderful weekend. 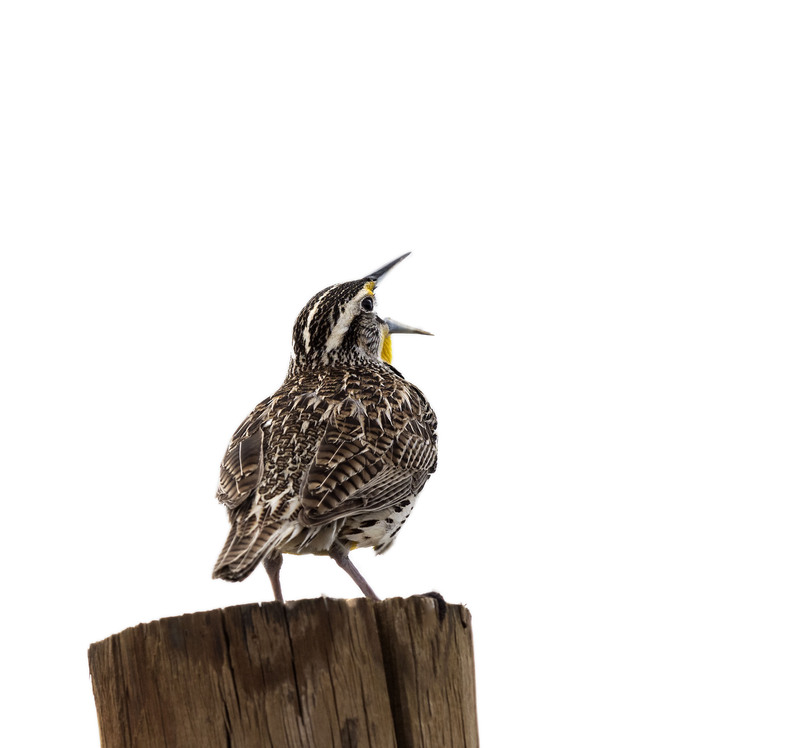 I adore the Western Meadowlark. Many a time their liquid-poetry-song has kept me going during my trailruns in the open space. Thank you for sharing. Hi Tracy, yes we also love the song of a Meadowlark on and early mooring outing although our are more likely to occur on a bike but nonetheless they help make a morning workout a thing of wonder. I have to ask, given the white background, was it blanketed in snow round there? Stunning image. Hi Graham, the background was actually a brightish grey sky that I altered to be whiter and make the bird stand out a bit more. Well, it certainly worked. I must confess that now you have disclosed a magic trick I feel just a little less amazed 🙂. Brilliant photo though, it is great to emphasise the star of the show in that way. Hi Graham, it is a good trick to use when you shot against a grey sky that is just plain dull with now obvious clouds etc.